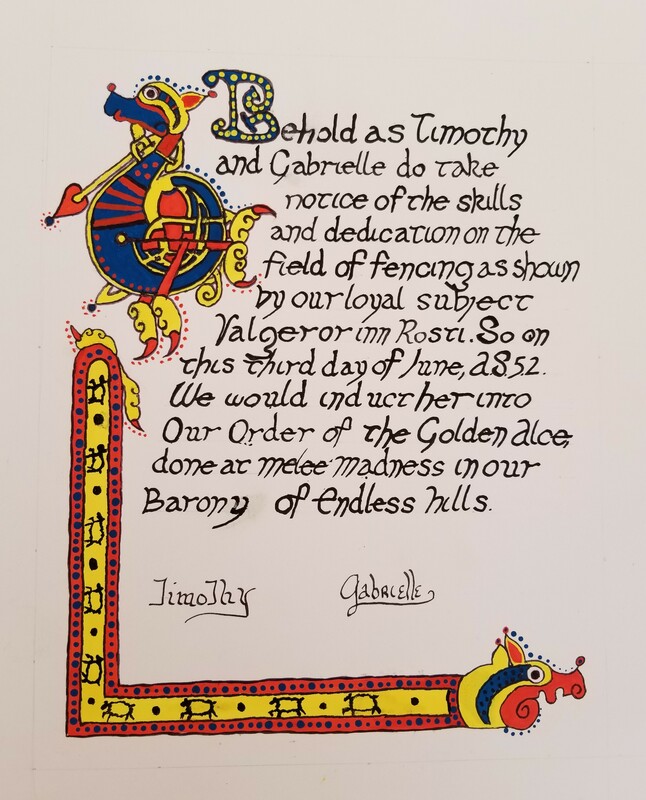 From the Scrolls of the Reign of Timothy and Gabrielle, King and Queen of AEthelmearc, as recorded by Dame Kateryna ty Isaf, Jewel of AEthelmearc Herald with the assistance of Countess Margerite Eisenwald and Maestro Orlando di Bene del Vinta at Melee Madness in the Barony of Endless Hills on June 3, Anno Societatis LII. Their Majesties, Timothy and Gabrielle, invited The Baron and Baroness of Endless Hills, Verdi Stephan and Fiona to Their court. Their Majesties asked the Equestrians who participated in the Kingdom Equestrian Championship to come forth. They thanked them all, noting that for many this was the first event they attended and Their Majesties were greatly impressed with the horsemanship displayed. They were especially thankful for the opportunity the equestrians afforded Their son, Timothy the Younger to ride in the procession. 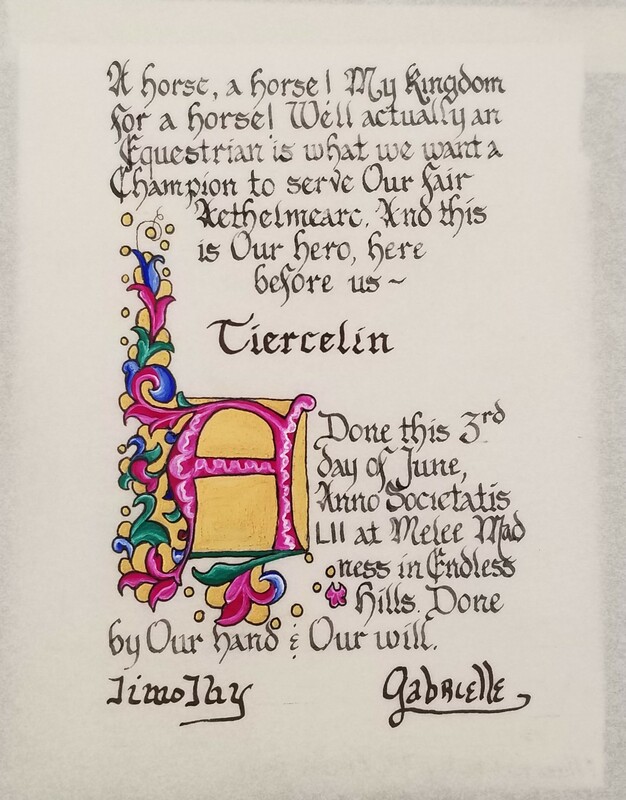 Their Majesties advised the court that while there were many participants who excelled, the Kingdom needed a Champion and thus They invited Mistress Ysebeau Tiercelin to stand as King’s Champion and Kingdom Equestrian Champion. They also invited Master Tiernach MacCaithal to stand as Queen’s Champion. Their Majesties called forth Ashley of Endless Hills. For her work in helping in the kitchen, retaining, with set up and tear down, Their Majesties inducted her into the Order of the Silver Buccle. Scroll by Lady Jinx. Their Majesties called forth the rest of the children present and asked Lord Nicolo to give the toy chest fleet feet. The children were instructed to take one toy each, beginning with the youngest child present. Having been given a count of ten, Lord Nicolo fled the court with the children fast behind. Their Majesties gave leave to Their Excellencies of Endless Hills to hold Their court. 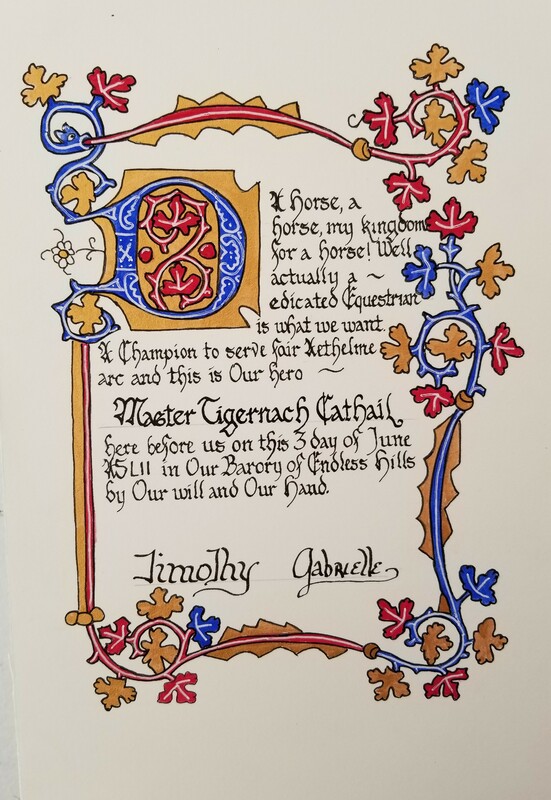 Upon the completion of the Baronial court, Her Majesty spoke of the honor and grace of the fencers who fought this day and how she was impressed by all the contenders. Knowing that there could be but one who would be called upon to be Her Champion, She invited before Her Master Clewin Kupfenhelblinc to stand as her Queen’s Rapier Champion. Her Majesty then called Lord Durante de Caravaggio forth and divested him of the regalia of the Queen’s Champion and thanked him for his service to both Coutness Marguerite and Herself. She invested Master Clewin with the regalia of his office and asked him to join the court as Her Champion. Before dismissing Lord Durante, Her Majesty invited Countess Marguerite to join Her in the next business of the court. The Countess spoke movingly of the service Lord Durante had provided to her and was pleased to be part of the court during this moment. Her Majesty then Granted Arms to Durante and awarded him the Queen’s Order of Excellence for his faithful service to Her predecessor. To mark his new station, a circlet was placed upon his brow, gifted by Her Excellency. 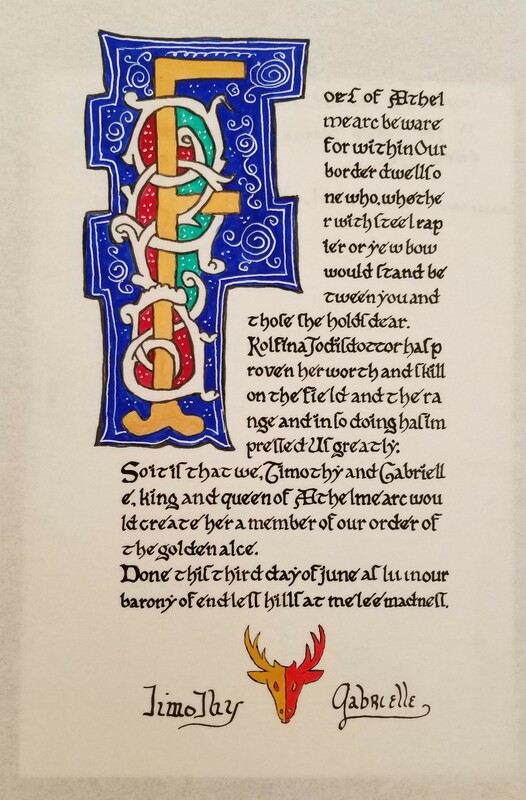 Scroll was limned by an unknown artist, words and calligraphy by Baroness Graidhne ni Ruaidh. Their Majesties called forth Helena Kobot. Noting that she was working diligently on her fencing, had started making her own garb and was always helpful at events, They were moved to make her a Lady of the court by Award of Arms. Scroll by THLady Máirghréad Stí­obhard inghean uí­ Choinne. Their Majesties called Vincenzo of Endless Hills. Gratified to see such a hardworking young man willing to take on the tasks of adulthood within the Society, They felt it only proper he be given the rank and station of an adult. Therefore for his work retaining, setting up and tearing down at events, helping autocrats and head cooks alike, They Awarded him Arms and made him a Lord of the court. Scroll by Baroness Fiona the Prepared. Their Majesties called forth Eustacious di Mecina. Because of he is a person who is seen everywhere helping in tasks great and small and always with a joyful and enthusiastic smile, Their Majesties saw fit to make him a Lord of the court and Awarded him Arms. 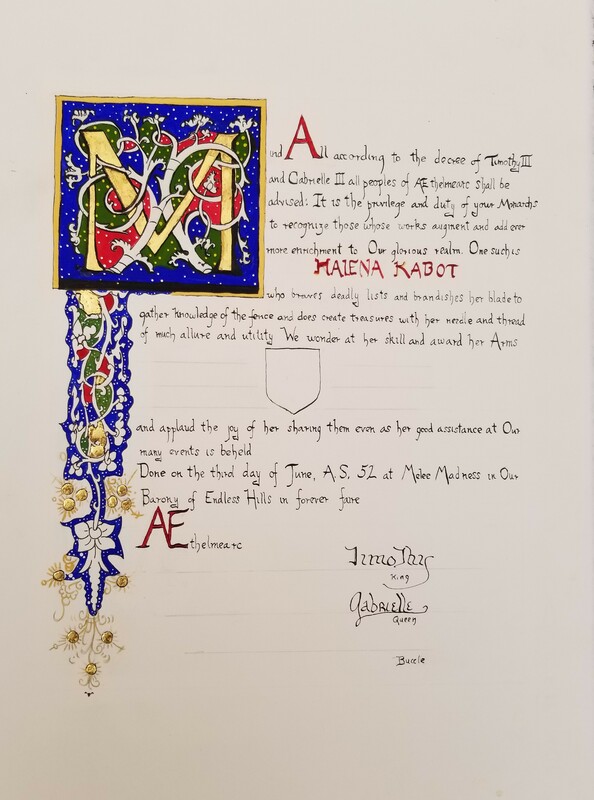 Their Majesties asked Their Excellencies to convey an award for Them since it was known that the Gentle in question would not be in Their presence to be given the award by Their Hands and charged Their Excellencies to carry this missive to him at Their next opportunity. 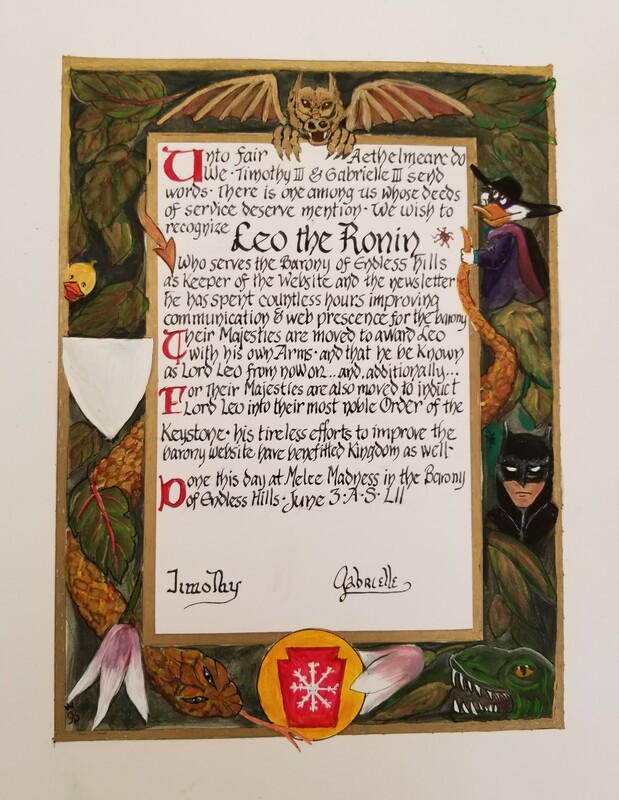 Their Majesties then had Lord Leo the Ronin added to the Order of the Keystone for his great endeavors in creating an online presence for the Barony of Endless Hills and his work as both Chronicler and Web Minister. Scroll by Baroness Barbary Rose. Their Majesties called for Lord Alayn Pyett to attend Them. 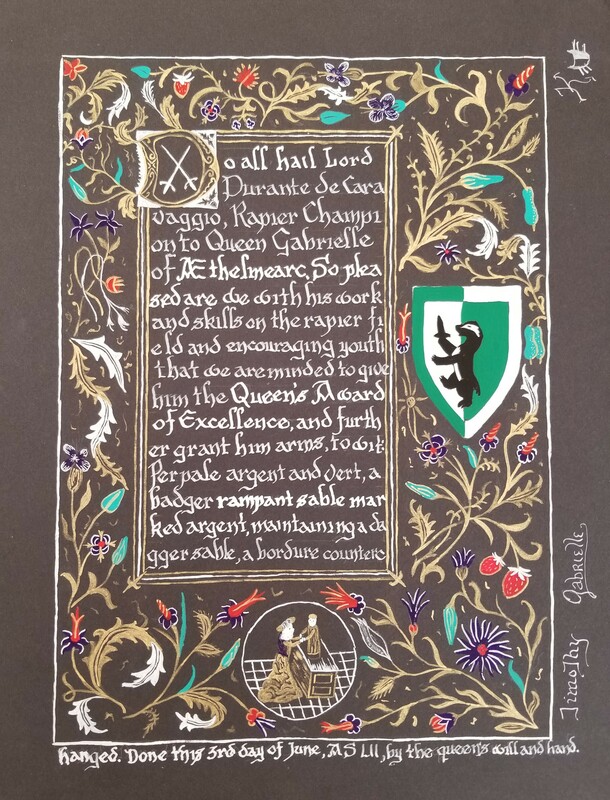 For his works of art as Blacksmith, wood carver and weaver, They inducted him to the Order of the Sycamore. Scroll by Baron Caleb Reynolds and Sir Murdoch Bayne. Their Majesties called forth Lady Kolfina Jodisdottir. 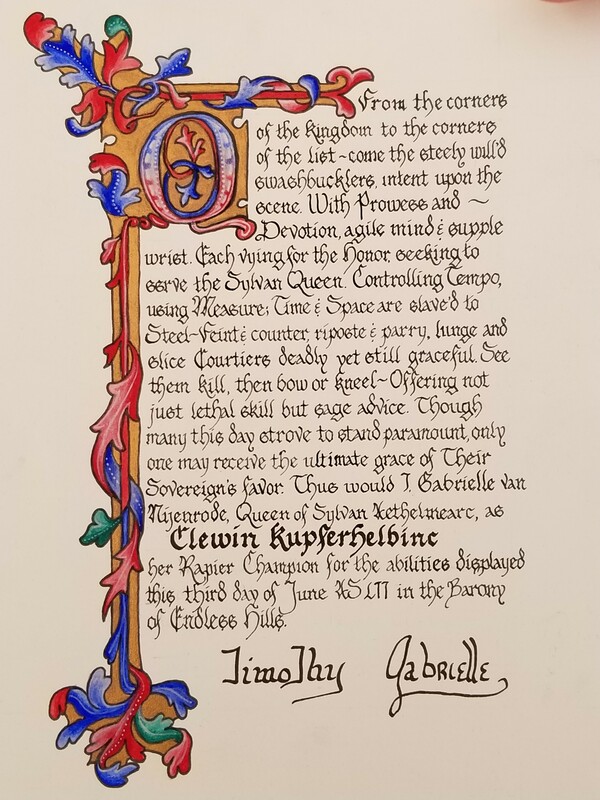 Knowing her to be skilled with rapier and bow, and dedicated to building her skills by rigorous practice many nights a week, They were moved to induct her to the Order of the Golden Alce. Scroll by Baron Caleb Reynolds and Sir Murdoch Bayne. Their Majesties called Lady Valgeror inn rosti to attend Them. A fencer who has chosen and researched the form of Destresa fencing, she has overcome obstacles to become a force to be reckoned with upon the field and so They inducted her to Their Order of the Golden Alce. Scroll by Lady Kolfina Jodisdottir. Their Majesties called forth Lady AEsa Hegulfsdottir. Knowing that she has served her Barony as Archery Champion, has been a heavy weapons fighter and is skilled with the bow, Their Majesties were moved to make her a Companion of the Order of the Golden Alce. Sir Murdoch presented her with the Golden Alce medallion passed down through the members of the order in her household. Scroll by Sir Murdoch Bayne. Their Majesties advised that it is Their right and privilege to give recognition long overlooked. 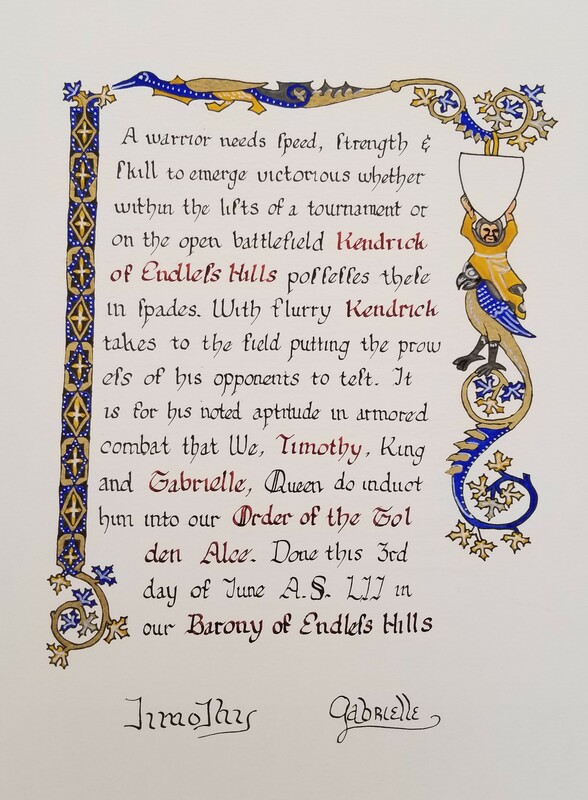 They called forth Lord Kenrick of Endless Hills and inducted him to the Order of the Golden Alce for his skill in heavy weapons fighting, his continued teaching of the combat arts and his service as Baronial Champion for Heavy Weapons combat. 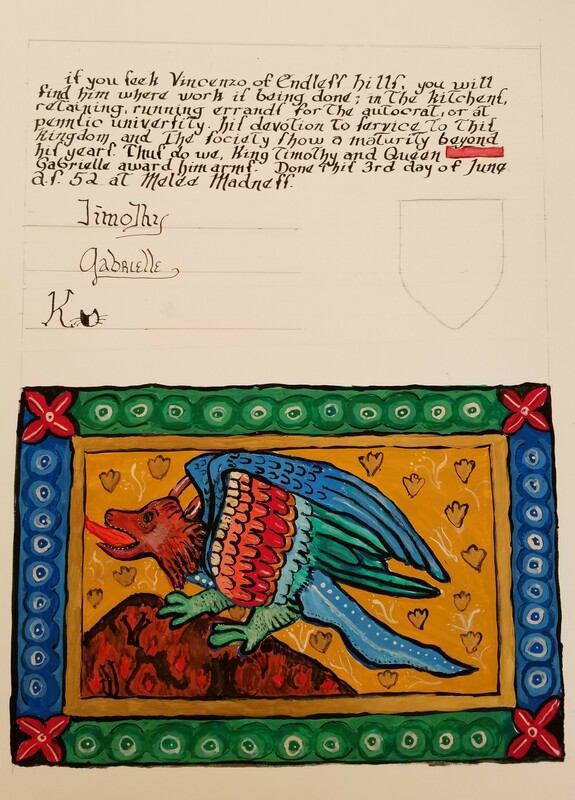 Scroll was limned by an unknown artist and calligraphed by Mistress Euriol of Lothian. Their Majesties invited before them Dame Kateryna ty Isaf. Their Majesties then called forth the Order of the Fleur d’Aethelmearc to attend Them. 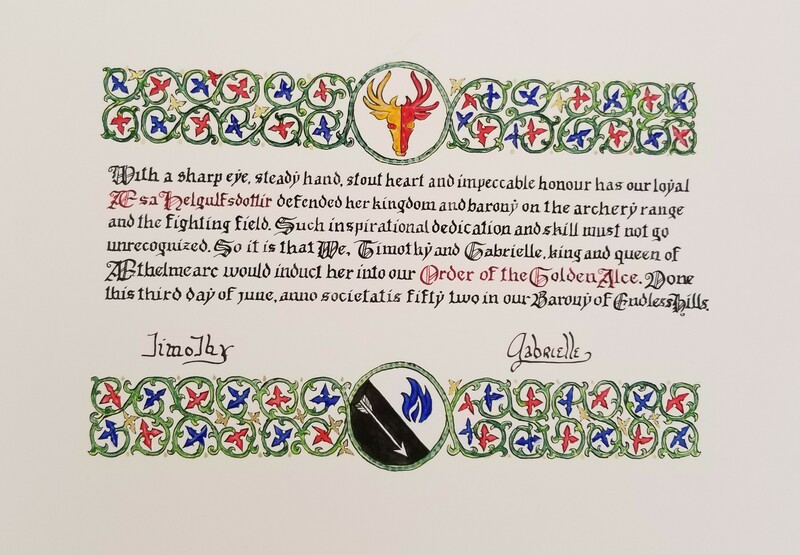 Speaking of how delighted They were to recognize her gift for feeding Their Realm both delicious and well researched feasts and how They were looking forward to yet another such feast this day, They were moved to induct her into the Order of the Fleur d’Aethelmearc upon this day. 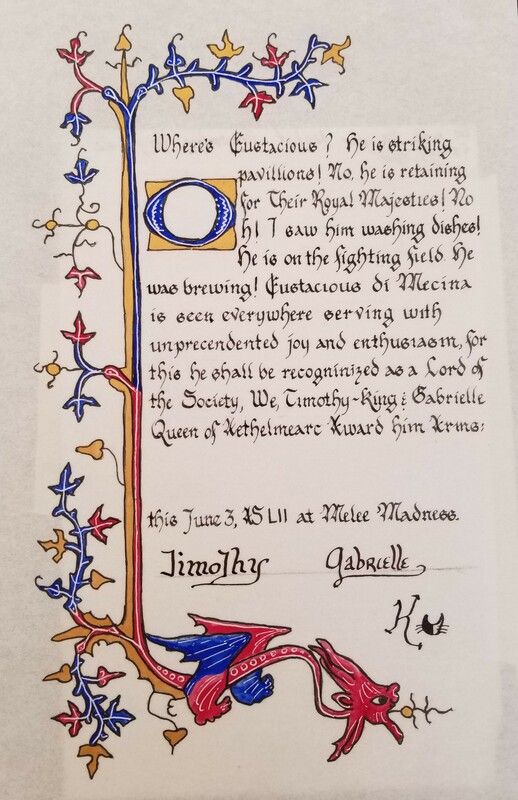 The scroll was by Sir Murdoch Bayne, wordsmithing by Lord Gregory Hillson. Their Majesties called before them Lady Antionette DeLorraine. 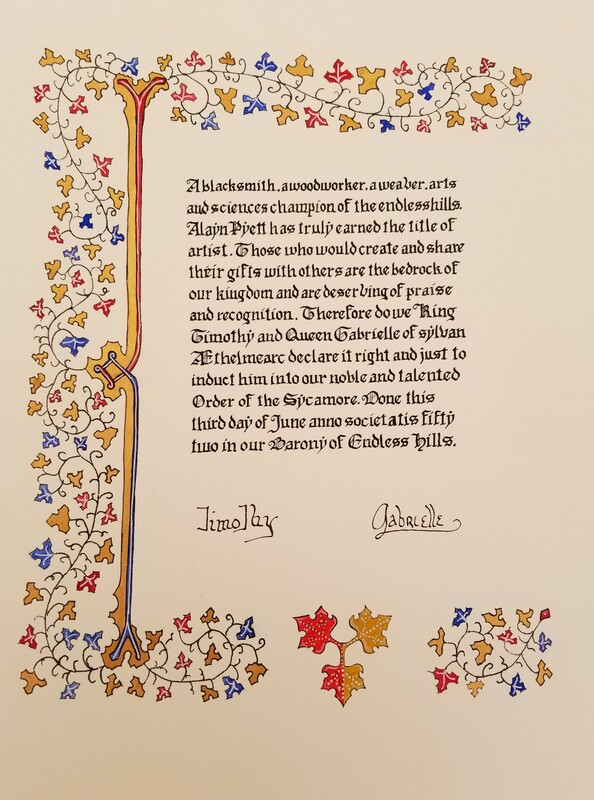 Their Majesties advised They having asked Their Order of the Millrind for counsel regarding gentles in the Realm deserving inclusion in that order, one name did rise to Their attention that They felt needed to be done immediately. Their Majesties then called for the Order of the Millrind to attend Them. They advised that for her work as Seneschal, Autocrat and many times serving as Retainer, They were moved to induct her to the Order of the Millrind and grant her arms. 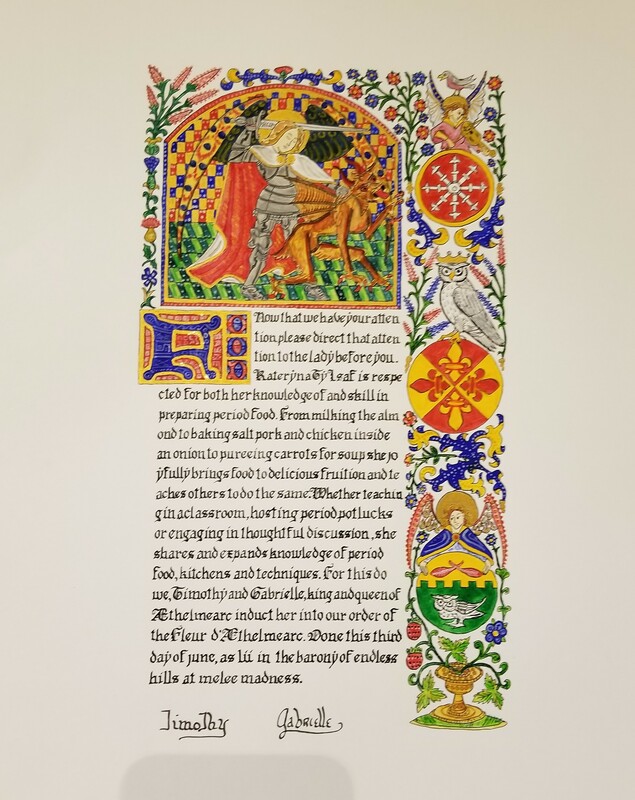 The scroll is a work in progress by THLady Alianora Bronhulle. Her Majesty asked Don Po Silvertop to attend Her. Her Majesty was moved to recognize Don Po as Her inspiration of the day and bestowed upon him the Golden Escarbuncle for not only his prowess on the fencing field, but also the joy he brings to his bouts and instills in others.